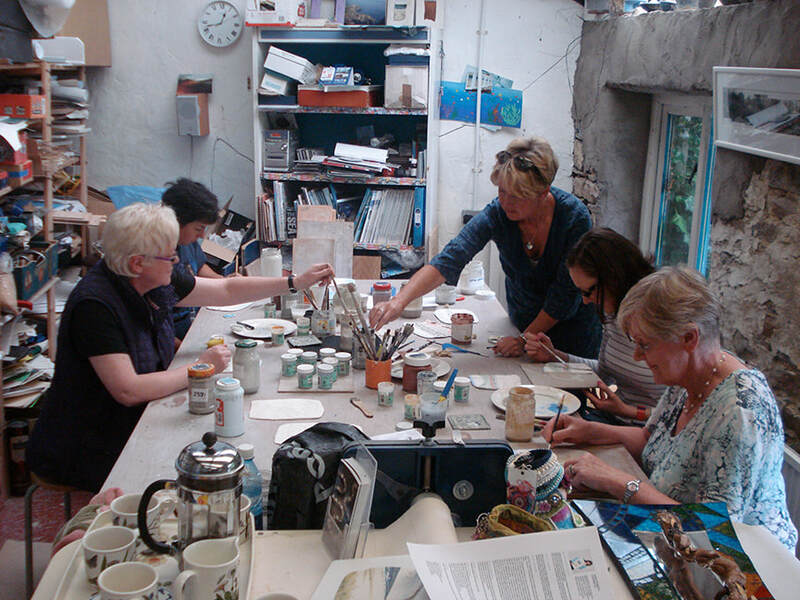 ​I took part in the ceramic workshops at Sara's as part of Cork Craft Month in August 2018. It was a wonderful experience. The atmosphere was very relaxed and friendly - a real feel good experience. Sara was very helpful and encouraging and shared her expertise and experience willingly. I would definitely recommend the workshops and Sara was a brilliant tutor and facilitator. I attended one of Sara's 3-day courses and it was a fantastic experience! The sessions were relaxed in such a pleasant atmosphere. Sara guided and advised us, encouraging full freedom of expression so that we could be truly proud of the accomplished work produced by our novice hands. And the home-cooked lunches were a sumptuous feast! Sara’s ceramic workshops are a delightful way to spend a few days learning how to work with clay and the food she serves is the cherry on the cake! Sara is very laid back, giving advice when needed and stepping back when you find your creative plan. She starts the work shop with coffee and delicious cake, a little talk on how to work with clay, explaining about textures and colours and then helps with any ideas you have in mind to get you started. There are pottery samples, books and lots of tools to help you create your own piece. Lunch is a delicious three courses in her warm, homely kitchen and then perhaps a walk up the fields to see spectacular views of the coastline. Then the afternoon flies by in a hushed silence of creativity. I have enjoyed a number of workshops with Sara and always look forward to them. I was on the Potters Council tour last June. I have fond memories of your studio and your beautiful acreage along the coast. I wanted you to know that you have helped me expand on some techniques that I have been using for years. Making these waterscapes has brought my work to another dimension. This ex-student from BC Canada was totally inspired! Out of all the Summercamps I’ve done, yours was the best. Sara offers the opportunity to learn about working with clay in the relaxed environment of her studio, found tucked away at the end of a long treelined laneway, immediately generating that 'getting away from it all’ feeling. Courses typically run over two days and are limited to 4 or 5 participants. We start at 10.30am and finish up about 4pm. As a beginner you will learn some techniques and design a number of your own pieces during the first session. If you are more experienced I will help you to work with your own ideas. Your work will be dried and fired over the following week, ready to be glazed in the second one-day session, after which the glaze firing will take place and pieces will be ready for collection a few days later. I can arrange mounting/framing and delivery if required. Price of €120 per day includes all materials, morning coffee, delicious home-cooked lunch and afternoon tea. A stroll up the hill after lunch is recommended to help digest and take in the fresh air while being inspired by the spectacular coastal views from the surrounding cliffs. If you choose not to partake in the glazing workshop I can glaze your work for you. Glazing, framing or delivery as required will incur an additional cost. Small groups can also book special courses tailored and scheduled to suit their needs. Relax in the comfort of a nearby home stay if you would like to overnight in the area before or after the workshop. Creative days for kids in July - please enquire or check my news page for updates.